Mossel Bay Golf Club was founded in 1905 with the original golf course positioned at the old aerodrome. 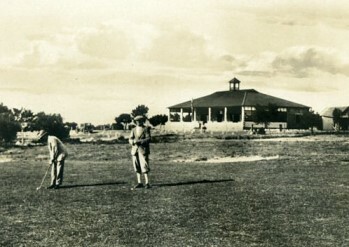 The land on which the present course was built was made available to the Club by the Mossel Bay Municipality in 1924. The course was designed by Bob Grimsdell and was built over a period of two years. The first President of the Club was Mr. A.I. Vintcent and the first Captain Mr. W.F Wright. The first official competition took place on 24 October 1926. The very first hole-in-one belonged to a lady, Me Doris Wassung, who achieved this on 14 September 1935. During the period 1930 to 1945 severe droughts and a devastating depression in 1933 made the survival of the Club extremely difficult. The whole of South Africa was suffering and the population became very poor. Only the determination and the dedication of the 87 male and 47 lady members at that time, pulled the club through those difficult periods. During 1999/2000 the golf course was redesigned by Danie Obermeyer and rebuilt by Philip Basson. This happened as the result of the vision of a developer, Mr. Urs Windholz, who developed The Mossel Bay Golf Estate (http://www.mosselbaygolfestate.co.za/) on the land surrounding the golf course. His vision included the rebuilding of the golf course and revamping of the club house to create a very upmarket, golfing facility. This development elevated the Mossel Bay Golf Club to another level where at the end of its first century in 2005, the membership reached 1046 and more than 45000 rounds of golf were played. The Mossel Bay Golf Club prides itself as one of the major tourist attractions in our town and in the Garden Route. We welcome you, our guest, to enjoy all our beautiful facilities.